Home » Blog » Planks vs Sit Ups: Which one is better? The truth is that planks and sit-ups focus on inner-core muscles, which includes reinforcing the transversus abdominis, so both of these exercises are meant to address the inner core muscle issue. This is important because most people’s inner core muscles are weak. Still, some wonder whether planks or sit-ups are better for addressing this problem. Some might think that focusing on inner core muscle strength is vainglorious. Sure, strengthening core muscles will end up refining the overall rectus abdominis. This is the area of the abdomen that most people can see and the area people love to show off when they have reached a desirable level of muscle definition. The problem is concentrating on just the aesthetic appeal takes away from the importance of inner core development. It might sound far-fetched, but many issues are linked to poor inner core muscle development, such as lower back pain or poor balance. (2) It should also be noted that weak core muscles can lead to poor posture. Only those with strong core muscles can withstand proper postures for a long period of time. 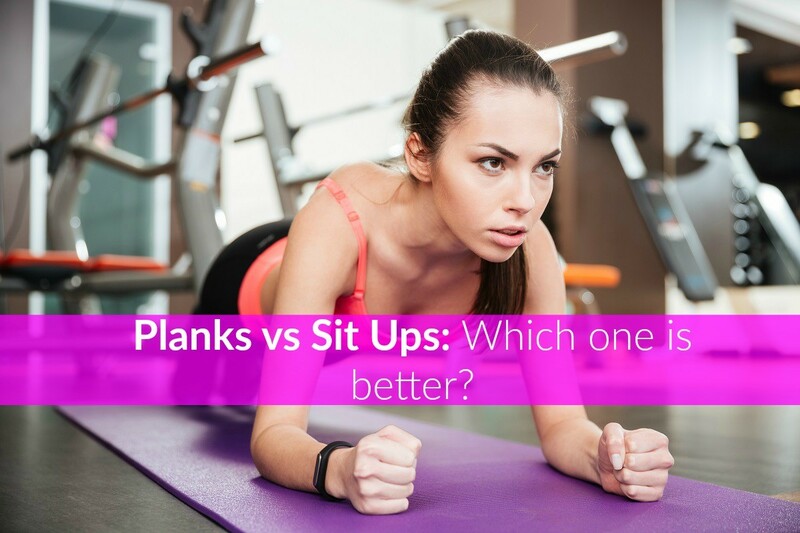 What is the Difference Between Planks and Sit-Ups? You know that both exercises focus on inner-core muscles, but each approach is different. The first thing that should be explained is the difference between the two. There are a number of things that should be highlighted about planks; for one, it is the only exercise that works well for those who have lower-back issues. Sit-ups can be quite taxing on the back and may be impossible for those with lower-back issues who want to improve core muscles. Planks are easier simply because they are hard to mess up regarding technique. This type of exercise focuses on the transversus abdominis, which should help create a strong, flat stomach. Yes, planks are great and will help reinforce some of the core muscles, but they basically focus on the issue from within. Granted, this is an important aspect and should help rectify any problems that may have risen due to weak inner core muscles, but there is a drawback. The hiccup is that planks do not redefine the abdomen. This means those hoping for a ripped stomach may not be able to achieve this goal without sit-ups. Making sure the sit-up is performed correctly can be difficult, especially without a trainer or proper instruction to help you along. This means a person could do sit-ups regularly but may not reap the benefits. Knowing the difference between the two is just the first step. Now, the proper way of performing these exercises must be explored as well. It is important that each exercise is performed correctly in order to receive the desired results. Performing a proper plank starts with getting on all fours. Some people put a blanket under the knees for added support. It is important that the hands are in line with the shoulders. The knees need to be bent and line up with the hips of the person’s body. Make sure your feet are facing downward on the floor. Keep in mind that breathing is very important during any exercise. It should always involve breathing through the nose and exhaling through the mouth. The next thing you need to remember is the legs should be stretched out and straightened. In essence, this part of the exercise should look like the beginning stage of a push-up. Be sure not to hike the buttocks or allow the midsection of the body to sink downward. The feet should be in line with the hips of the body for added support and balance. Sit-ups are definitely more difficult and may not be helpful when done incorrectly. The first thing that needs to be taken care of is the starting position. This starts with a person laying down with the knees bent. The heels should be flat over the floor or mat if that is being used. The next step is to hold the shoulders with opposing hands, which basically looks like the arms are forming an ‘x’ over the chest. This is an important step because it ensures that there is a rising point. The core muscles need to be tightened before the exercise begins. This is done by slowly sucking in the belly button toward the spine. All one has to do now is lift up the body from the ground. This should start with the head, followed by the shoulders. The core muscles should be contracting at this point, and the goal is to reach a 90 degree angle. Keep in mind that all this needs to be done slowly. This will increase safety and be gentle on the body. The feet should not move during this entire step and should remain flat on the floor. Do not lay flat on the floor or mat once the starting position is reached. The back should be arched just a bit and then repeat. Other types of sit-ups follow these same steps but include things like twisting the abdomen while rising to reach that 90 degree mark. It all boils down to a few things. For one, those who want true core strength and the benefits will have to settle for plank exercises. It seems that flexion-centered exercises like sit-ups may lead to some disc wear and tear, which are two things that no fitness-enthusiast wants to deal with. Another strike against sit-ups is they force hip flexors to overwork themselves. This means the person performing sit-ups will eventually strengthen the muscles that form a bridge between the top of the legs and the lumbar vertebrae. No one is saying that keeping hip flexors in good condition is bad, but there is such a thing as excess. Too much strength in these areas could end up putting pressure on the lower side of the spine. This can end up causing lower back pain. Those who have already been doing sit-ups should consider stopping and making sure the practice is being performed correctly. The aforementioned steps could prove helpful, or a professional fitness coach’s advice may be needed. In short, planks and its many derivatives are the best type of exercise for those who are interested in strong inner core muscle building. There are many reasons why people choose planks over sit-ups though they may still be helpful if mastered. » Test inner-core strength by performing the plank exercise for longer than 60 seconds. » Learn the techniques perfectly before starting. » Stick to the exercise regimen. » Consider a mixture of these exercises if a six pack is desired. » Stay hydrated, and eat a well-balanced diet. Hopefully, this information help ensure that any issues with inner-core muscles are addressed with the right exercise. It would still be wise to consult a professional just to make sure. You don’t want to risk hurting yourself or not achieving the results you want.